Avatar Therapy is a new approach to the treatment of certain mental health conditions, particularly auditory hallucinations (hearing voices). The therapy was invented by Prof. Julian Leff to improve the lives of schizophrenic patients suffering from persecutory voice hallucinations despite the best available drug treatment. 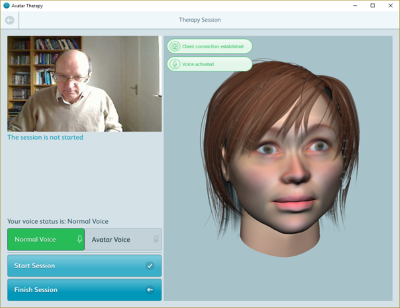 In Avatar Therapy, computer avatars are designed by patients to give a face to the voices they hear; these avatars then interact with the patient in a simulation of their persecutory voice. Under direction from therapists, patients are encouraged to challenge the voice and allow it to come gradually under the patient's control. You can read details about the science of Avatar Therapy and obtain references to published articles at the Avatar Therapy Project website. We have recently completed a major clinical trial of Avatar Therapy at the Institute of Psychiatry funded by the Wellcome Trust. This trial involved 150 patients with persecutory voices divided between two therapy approaches. The results of this trial have recently been published in the The Lancet Psychiatry. A summary of the outcomes of the study can be found in this UCL Press Release. A short video about the Avatar Therapy trial can be seen in this BBC News report. Training courses for clinicians wishing to use Avatar Therapy with patients are currently under development. If you are a clinician interested in obtaining a licence to evaluate the software system, please contact Derek Reay at UCL Business: d.reay@uclb.com.